History of the Old Plough Revived in Rea Street at Digbeth in Birmingham in the county of Warwickshire. The Old Plough Revived was located on the north-western corner of Rea Street and Moseley Street in an area where Digbeth meets Highgate. The pub was once called the Old Plough Revived but was later changed to the Old Plough Inn. The name of the house, the Old Plough Revived, is an unusual name and suggests to me that the sign of the Plough may have been held by an early publican who moved to this location. However, the earliest reference I have seen for a beer house on this corner is for Edward Jones in 1840. There is no reference for a boozer in the previous year's trade directory. Looking back to 1835 Pigot's Directory there are two beer retailers listed by the name of Edward Jones. The first was at No.54 Dudley Street and the other for New Canal Street. I am not aware [yet] that a Plough Inn existed in either of these thoroughfares. But you never know, the name may emerge at some point! Dudley-born Edward Jones was a whitesmith by trade and kept the Old Plough Revived with his wife Jane who was a Brummie. They remained throughout the 1840s and were eventually helped by their niece Jane who had grown up on the premises. It is interesting to note that throughout this time William Male was working as a file cutter in the neighbouring court. I say interesting because when he passed on his widow Naomi continued the business for many years, working up until an elderly age. She was the definition of a life of hard work. Edward and Jane Jones did pretty well at the Old Plough Revived and invested their money wisely. They were able to retire to a house in Macdonald Street where they were recorded as proprietors of houses and land. William and Jane Burton were hosts at the Old Plough by 1860. William was from family of publicans, though he was working as a cordwainer when he married Jane Hewson in November 1858. Indeed, it was boots and shoes that were his real passion and he returned to this trade when he and his wife moved to Mary Street. Macclesfield-born Charles Hollingworth was the licensee in the early 1880s. He kept the Plough Inn with his wife Sarah. The couple would later spend many years in Cathcart Street running a grocery and offie. The Plough was placed on a list of houses for redundancy in 1909, a particulary harsh ruling for Rushton's Brewery Limited as this house was one of six public houses they operated that had been been selected by the magistrates. 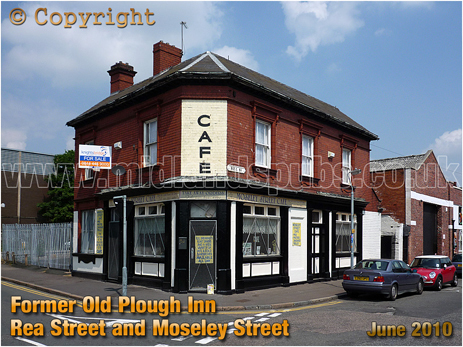 This photograph shows the former Old Plough when the building was trading as the New Moseley Street Café. The building had served as a café for many years. It was once a well-known place called Bob's Café for a fairly lengthy spell. More information on the Old Plough Revived at Rea Street to follow. I probably created the page as I had a link to the Old Plough Revived from another page. When building the site it is easier to place links as they crop up rather than go back later on. I realise this is frustrating if you were specifically looking for information on the Old Plough Revived. There is information on Birmingham dotted around the website - click here for a suitable starting place. 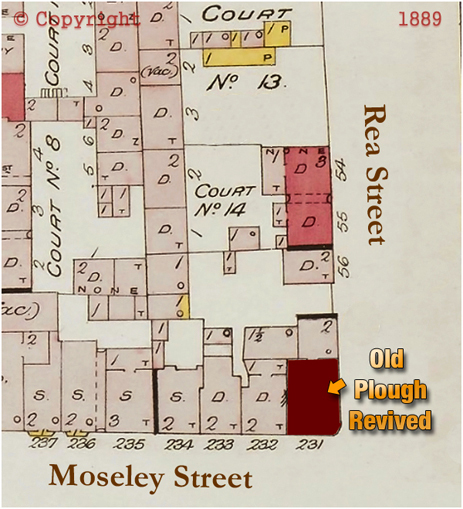 I have marked the location of the Old Plough Revived on the corner of Rea Street and Moseley Street on a plan dated 1889. The houses fronting Moseley Street lasted for many years but Court 13 and 14 in Rea Street were occupied by a metal works during the inter-war years. If you have a genealogy story or query regarding the Old Plough Revived you can contact me and I will post it here in addition to including your message within the website pages for Birmingham Genealogy.